Germany-based KraussMaffei Berstorff has sold a Schaumex ISO-PAC foam extrusion line to a customer in Asia. “We are faced with an increasing demand for Schaumex lines at international level. Recently, we have sold two Schaumex 120 lines with an output rate of 210 kg/hour and two Schaumex 150 extruders with a low-expansion film production capacity of up to 320 kg/hour to customers in Asia and Eastern Europe,” reports Matthias Reimker, project manager for foam extrusion lines at KraussMaffei Berstorff. All four lines sold feature round-section dies and Teflon-coated die lips and are equipped with an efficient outside air cooling. The cut flat sheet is cooled down on a take-off unit with two water-cooled cooling rolls of 600 mm length and subsequently wound up. In addition to the single-stage Schaumex process, KraussMaffei Berstorff offers Schaumtandex solutions composed of a primary extruder for plasticising and homogenising and a secondary extruder used for melt cooling. The firm says its equipment offer the perfect solution for eco-friendly and cost-effective production of cap seals made of PE low-expansion foam. 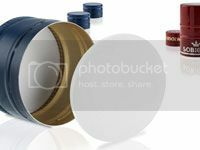 As these seals are required for air-tight closing of screw caps used for bottles, containers and jars, the worldwide demand for this type of equipment is continuously rising, adds the firm. 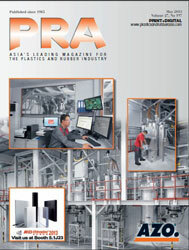 The machine portfolio comprises various production lines for physically foamed products. The Schaumex single-screw extruder series produces sheets, film, pipes and profiles. The machines combines all process steps in a single machine - from compounding, blowing agent injection and incorporation up to the final cooling stage. These steps are of decisive importance when using CO2 as environmentally compatible blowing agent in the production of expanded products. The extruder has a processing section of 40 L/D length with electrical heating and air-heating systems in the compounding and mixing section to melt the plastic material at about 200 degree C and to mix in the required additives. The CO2 blowing agent is injected through a special injection system in the central section of the extruder barrel. The processing zone downstream from the injection point is equipped with a fluid temperature control to cool down the melt with the blowing agent to about 130 degree C.
“Expanded sheets with a density ranging between 250 and 450 kg per cubic meter are referred to as low-expansion foam“, explains Reimker. “15,000 tonnes of PE based low-expansion foam are produced in Europe every year.“ Considering the weight of approx. 0.4 grams of each typical seal with 2 mm thickness and a diameter of 25 mm, the production quantity after edge trimming corresponds to about 75 million seals per day,” adds Reimker. As this large niche market is also faced with an increasing demand for eco-friendly solutions, today about 75% of low-expansion foam products are produced on the basis of non-polluting physical foaming processes, and only 25% using chemical foaming. Apart from environmental aspects, this is also due to the fact that reaction products of chemical foaming processes may affect odour and taste, which must be avoided in the food sector.